I get that The Rock is a huge movie star, and I get why DC chose not to use him as the villain in their first Shazam! film. Still, plans to have him star in a solo movie before even meeting The Big Red Cheese have me scratching my head. I think there is plenty of room for Black Adam to have an origin and back story fleshed out in a regular sequel to Shazam! Go ahead and give Dwayne Johnson top billing if that's what it takes. 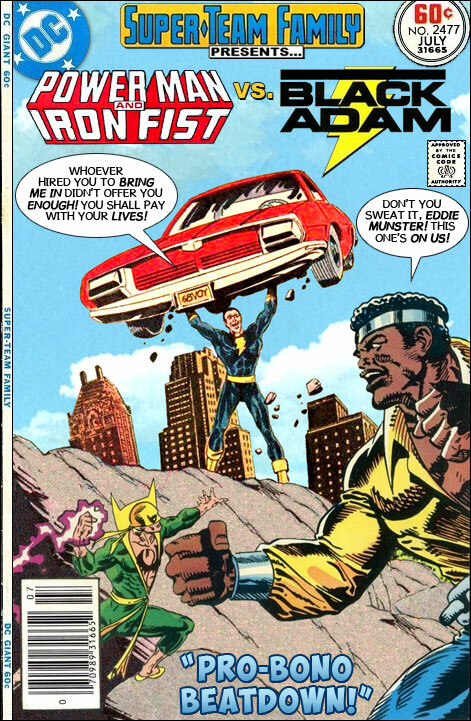 If a sequel is a huge hit, then maybe consider giving Black Adam his own solo vehicle. My guys are horribly outclassed but that crack might floor Adam like it floored me! "Eddie Munster?" Haw! Gotta disagree, dude. That sequence might've worked for him in "Mummy 2" and "The Scorpion King." But, lightning doesn't always strike twice in a row, at the box office. I think the sequence will work out fine. Black Adam can be developed as a sort of antihero (or antivillain), setting up the conflict of the second Shazam! movie, setting up a relationship between the two characters that's even more interesting than we've seen in the comics, either originally or recently. That sequel might, for example, feature Mr. Mind as the story's true villain, and the two lightning-powered stars eventually figure this out and team up against him, never becoming "buddies" but still working as temporary allies with a grudging respect for one another. And the "Eddie Munster" crack got me as well. It totally should be used in one of those two movies. As long as MR. Mind is in the mix, I am happy with whatever they have planned! Getting back on topic (re: today's cover). Who would hire Fist and Cage to after a literal heavy-hitter like Black Adam? And, more importantly, why? Did Kahndaq invade neighboring Halwan, perhaps? Sweet Christmas! He don't look all that black to me that Adam. The Original Disco Boys! Eat your heart out Casanova Frankenstein. Black Adam VS Bklack Vulcan in: "Black Like Who?" In Colour, today's episode; "Ruhn Farrest Ruhn". A Quinn Martin Production. Perhaps the decision was made when they were all caught up on their grimmer and grittier than the dark Knight Zack Snyder fever. "We need an anti-hero to be real literature" and all that. @Cary: given Luke's word balloon, I think it's something more personal. For instance? Khem-Adam might've had his way with the Maid of Might! Personally, I'm just curious about whom Danny would bring along on a double-date with the Power Couple. Zatanna, perhaps? I still find it hard to forgive certain DC writers for what they did to Isis: She and Adam made such a lovely pair, and I liked the "love redeems" aspect of their story, so even if she was introduced in '52' with her dark future already mapped-out by the authors I'd have preferred it if they'd been allowed a "Happy Ever After". @Simreeve: true! If they're using "New 52" to bring the whole JSA back, why not Filmation Isis, as well? Unrelated: In a recent discussion (elsewhere) on Spider-Man's foes, someone asked who our favorite Spidey-villain is. Mine, as I think I've mentioned here before, is the Lizard; there's just something about a reptile and a lab coat that screams coolness to me. Afterward, I got to thinking about how similar his origin is to Man-Bat's, and wondered if those two had ever met on this blog. I took a look, and was only slightly surprised to see that they hadn't! Maybe their similarities could be drawn into a connection, somehow -- like, their work was identically sabotaged by the same person who had some secret ulterior motive! If nothing else, seeing the two of them together should make for some fun visuals. Speaking of Filmation, have the Nitwits ever appeared on this blog? Was that the live-action show where Chuck McCann and Bob Denver accidentally "lunch" themselves into space while loading pre-processed foods into an experimental NASA spaceship? Naw! That was "Space Nuts." Cary Comic I have fond memories of the Far Out Space Nuts (CBS), and The Lost Saucer (ABC Funshine Saturday)! :) In the 1970's on to 1984 if Kid's programming was on I was indoors, when sports started I was outside playing or doing yard-work, or playing while doing yard-work if I was out @ the house. No capers and no capris. Hey I riff off what I read. @Anonymous Ree HEE HEE HEE! Rooby Rooby ROOOOOOO! Where does he get those marvelous yellow shirts with the metal cuffs? The Nitwits were the Old Old Man (Artey Johnson) & The Old Woman (Ruth Buzzi) From Laugh-In Animated By DePatie Freleng (famous for The Pink Panther Cartoons) as a Married Senior Citzen Super-Hero Crime Fighting Duo (I did not Make this up). AND Now back to our regularly scheduled Silliness already in Progress. ZOOTY ZOOT ZOOT!!! The Series was Called Baggy Pants & The Nitwits (NBC DePatie Freleng 1977 13 Episodes) Baggy Pants was an anthropomorphic cat that dressed and acted like Charlie Chaplin's The Little Tramp silent motion picture character. NO I am not on recreational pharmaceuticals nor am I "medicated" neither am I inebriated. I forgot to mention it was a cartoon series. @Brother Barnes: ah, yes! Now, I remember. Thanks! Brother Barnes is neither high nor deluded. I remember BP&tN,too. @Anonymous: "Sweet Xmas Tree Shops." LOL! Good one. "Where does he get those marvelous yellow shirts with the metal cuffs?"